WFP and partners have reached thousands of people recently displaced by Boko Haram in Chad and Cameroon with life-saving food and nutrition support. The United Nations World Food Programme (WFP) announced today that, along with its partners, the agency has, over the past week, has been able to deliver life-saving food and nutrition support to thousands of people recently displaced by the Boko Haram violence in Chad and Cameroon. In Chad, more than 5,000 internally displaced people (IDPs) received food and nutrition assistance for the first time as insecurity and access concerns had cut them off from any support. Distributions are now ongoing, and WFP said it aims this month to reach up to 35,000 displaced people, similarly cut off previously from any assistance. “In the areas north of Baga Sola, in Chad, the displacement sites have mushroomed in a matter of months – up to 22 sites,” said Mary-Ellen McGroarty, WFP Country Director in Chad, who said the agency had been told that people have been struggling to survive. Some people said that they have been surviving on nothing but maize for weeks. “We have started distributions at five sites where the needs are most critical and we are working to reach others. There are no roads so reaching these sites means a 300 kilometre round trip in the sand. We would like to move quicker but the challenges are enormous,” she added. Since December, continued and increased violence in northeast Nigeria and along the border areas uprooted 400,000 more people, according to WFP. During the same period, the number of people displaced in Niger, Cameroon and Chad has nearly doubled. To date, an estimated 2.8 million people have been displaced internally or across borders; 2.2 million are in Nigeria. Insecurity, displacement, and disruptions to agricultural activities and cross-border trade, continue to undermine communities’ livelihoods and their ability to produce or buy enough food for their families. 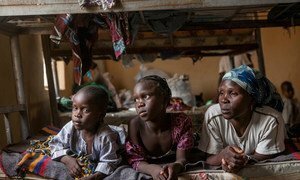 There are more than 5.6 million people facing hunger in areas of Nigeria, Cameroon, Chad and Niger affected by the Boko Haram violence in. WFP is concerned that the lean season, which normally starts in May/June, could start much sooner. “This assistance comes at a critical time as we have seen a rising flow of people forced to flee their homes due to ongoing violence,” said Denise Brown, WFP Regional Director for West and Central Africa. In response to growing food insecurity, malnutrition concerns and continued displacement in the Lake Chad Basin, WFP aims to scale up its assistance from 600,000 to nearly 750,000 people, including refugees, internally displaced people, returnees and host communities. In areas where food is available and markets are functioning, WFP aims to gradually introduce cash-based transfers, allowing people to buy the food that they need, and at the same time injecting money into the local economy. In recent days, 35,000 internally displaced people and vulnerable local residents have benefitted from the first cash-based transfers in Niger’s Diffa region. The vast majority fled their homes 12 to 18 months ago but as violence continues they cannot return. WFP is entirely voluntarily funded by contributions from governments, the private sector and individual donors. WFP urgently requires $75 million to cover immediate needs until July for displaced people and vulnerable host communities in the Lake Chad Basin. Of this, about half has been secured. United Nations human rights experts have urged the Nigerian Government to ensure that the areas they claim to have liberated from Boko Haram forces are truly safe for the displaced persons to return.